These are webinar and traditional classes offered by the Network and other members of Empire State Library Network. Please see each class description for more information about class location and registration. A group of NNYLN member librarians from the HS to College Interest Group is discussing ways in which to facilitate communication among high school, public and academic librarians to help students successfully transition from high school to college. 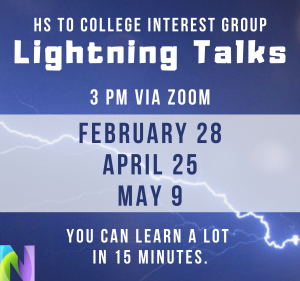 As a result of this discussion, the HS to College Interest Group came up with the idea of doing “lightning talks” once a month through Zoom hosted by NNYLN. 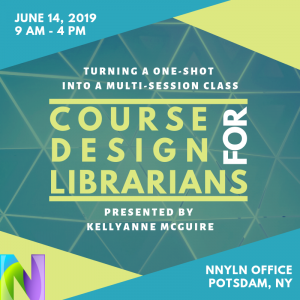 These are short 15-minute presentations followed by 15 minutes for open discussion among participants about a project, an experience, collaboration or anything you feel others involved with library instruction in the Northern New York would like to know. If you are interested in presenting a lightning talk, please email Christi (christi@nnyln.org). When students do research, they tend to look for sources first and then design their own writing based on information they have already found. Scaffolded writing assignments help students understand their own metacognitive processes and also help slow down the writing process. This discussion will focus on the first two sections of a six-part writing assignment I use in a freshman writing class. April 25: Michelle Oakes from Salmon River Central Middle School will talk about Project Based Learning. May 9: Carl Andrews, Reference & Instruction Librarian at the Bronx Community College, will speak about the recent LACUNY Institute 2019 (May 3, 2019) and highlight relevant content concerning relevant to college readiness and high school/college collaborations. Learn the basics of searching your family history. Learn the many resources that are available and how and where to access them. Getting started is easy with the charts and forms that will be provided. * This special offering is brought to you by the Central Libraries utilizing Central Library Development (CLD) funding. Please note TIME and DAY vary from the normal continuing education schedule for this class. Discover your family history using many of the resources that Ancestry.com has to offer. Census records, family trees, immigration records, vital records such as marriages, births and deaths are just a few of the types of information that you will have access to. Audience: This webinar is for anyone interested in learning more about mental health issues, but will be of particular interest to people working in hospitals, public libraries, or academic libraries with vulnerable populations. Description: May is National Mental Health Awareness Month. In preparation for this important time, Jean Poland from the National Alliance on Mental Illness, Finger Lakes (NAMI-FL) will present information for library staff and others in regard to this important and timely issue. Beginning with an overview of the prevalence of mental health issues among the general population, this webinar will cover is the stigma and discrimination people with such illnesses face. We will discuss how illnesses are defined, medications, and the effect of stress and trauma. We will cover safety issues and provide resources to support individuals affected by mental illness and their communities. Presenter: Jean Poland is a retired librarian and library administrator who has worked positions in Oklahoma, Massachusetts, Indiana, and Cornell. She received the MA in Librarianship from the University of Illinois. Jean is an active member of the National Alliance on Mental Illness, Finger Lakes, serving in leadership positions on the Board of Directors, leading family support groups, co-instructing twelve-week Family to Family educational programs, and co-leading Family and Friends programs for the general public. She is a recipient of the Mental Health Association’s Kirkwood Award for advocacy in support of people with mental illness. Click here to go to SCRLC’s website to register. This webinar is presented by the South Central Library Resources Council (SCRLC), a member of the Empire State Library Network (ESLN) – all questions and registration should be directed to SCRLC. Historical newspapers are a wealth of information. Learn what local historical newspapers are available and how to access them. Tips on searching will also be discussed. The Northern NY Library Network invites members to the 54th annual meeting at the Mirror Lake Inn in Lake Placid. Description: In this speaking session, we will discuss moving the discussion from advocating for our organizations through stories to organizing our community and creating activists to order to build political power and influence. We’ll look at how our current advocacy model is failing many organizations causing massive defunding and closures and we’ll explore many of the strategies and tactics used by some of the best community organizers, political action committees, and politicians to build real actionable support from networks of change through community organizing and political action. We will emphasize the resources and skills that organizational staff and supporters need to develop if they want to have the political and community support that they need in order to increase support and funding. About Patrick ‘PC’ Sweeney: Patrick is the co-author of Winning Elections and Influencing Politicians for Library Funding and Before the Ballot: Building Support For Library Funding. He is the former Administrative Librarian of the Sunnyvale (CA) Public Library and Executive Director of EveryLibrary California, a statewide initiative to support library propositions. He currently works as the Political Director for EveryLibrary, the nation’s first and only national Political Action Committee for Libraries and is a lecturer on politics at the San Jose State University iSchool. He is a 2015 Library Journal Mover and Shaker and 40 Under 40 Winner from the American Association of Political Consultants for his political and advocacy work supporting libraries across the country. He can be found online as PC Sweeney. The schedule also includes a presentation of the NNYLN Excellence in Library Service Award; recognition of outgoing board members; and more. Additional details are forthcoming. A light breakfast, as well as lunch, will be provided. The afternoon session will relate to the keynote from the morning – details forthcoming. This event is free to NNYLN members. This program is also offered via web conference at the Oswego Public Library and Potsdam Public Library. This workshop will provide an introduction to the NYS Public Library Construction Program including an overview of the grant requirements, project eligibility, the application process, and the grant award timeline. Join us to discuss your library’s proposed construction project and whether this program can help your library to meet those needs. We all know that workshops and one-shots have varying degrees of success meeting students’ information literacy needs. Attendance, student engagement, and faculty buy-in are all impediments to success. What if you could turn your ideas into a multi-session course, giving you control of the curriculum and learning outcomes? During this day-long workshop intended for academic librarians, participants will take a topic they are interested in and turn it into a multi-session course. In the morning we will focus on course development, including determining learning outcomes and scaffolding assignments. In the afternoon we will focus on pedagogy, including creating lesson plans and leading a class session. We will also brainstorm ways to adapt this model to individual environments (based on needs, resources, staffing strengths/limitations, etc.). This workshop is hands-on. Participants are asked to come with an idea for a class in mind (for example: What is something you are interested in teaching more in-depth? What skill do faculty say students lack? What topic would add to your school’s curriculum? ), as well as an internet-enabled device for independent and group work (laptop, tablet, etc.). Participants will come away with a rough syllabus for a multi-session course, a few lesson plans/assignments geared towards their topic, and an understanding of how to facilitate class sessions. Light refreshments in the morning and lunch included. Please use the comment box to relay any food sensitivities or preferences. KellyAnne McGuire is the Outreach Librarian at the Alumni Library at Bard College at Simon’s Rock in Great Barrington, MA. She has worked and volunteered at public, high school, and academic libraries in NY and MA. She has taught classes at the high school and undergraduate level both in-person and online, as well as numerous workshops for patrons of all ages. Most recently, she helped develop an information studies curriculum at Simon’s Rock consisting of ten, one-credit, half-semester (seven-week) courses taught by librarians that provide opportunities for students to develop metaliteracy and resilience within academia and beyond. KellyAnne has a BA from Mount Holyoke College, and a MSLIS from the University of Illinois at Urbana-Champaign. The most exciting idea blast you will attend all year! Library staff will provide 5-minute glimpses into their innovative services, successful outreach grants, and conference experiences; with an emphasis on idea sharing. Come with your hungry mind, leave with a belly-full of inspiration. Your Google account can do more than just email. Let Matt Corey take you on a journey to unlock the hidden potential that was inside your Google account this whole time; Drive, Docs (like MS Word), Sheets (like Excel), Forms (online web forms), Slides (like PowerPoint), Draw, sharing and collaborating, and MORE! This program will also be provided via web conference at the Oswego Public Library and Potsdam Public Library. Please click here to view presentations from previous classes.